A species of cnidarian in the genus Relicanthus with 2.5-meter-long tentacles attached to a dead sponge stalk on a nodule in the eastern Clarion-Clipperton Zone. These are closely related to anemones. The ocean is one of the last frontiers on Earth. But the world's ever-growing need for minerals and metals is pushing humans to boldly go where no human has gone before and they’re finding new life in the process. Scientists at the University of Hawaii at Manoa studied a 900-square-kilometer region in the Clarion-Clipperton Zone (CCZ) in the Pacific Ocean. Their mission: to seek out new life and new marine civilizations. 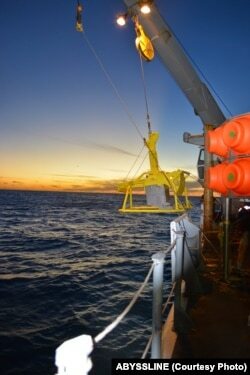 They published the results of their first deep sea dive in the latest issue of Nature Scientific Reports. The CCZ is a flat expanse of seabed nearly the size of the United States, nestled between the mountainous Clarion and Clipperton Fracture Zones, between Central America and the Hawaiian islands. It is known to contain an array of minerals, such as copper, nickel and cobalt, contained in potato-sized clumps (5-10cm). These metallic nodules are scattered along the seafloor, 3,000 to 6,000 meters below the ocean surface. The International Seabed Authority (ISA) licensed a specific area of the CCZ to UK Seabed Resources Ltd. for exploration. But before the company can begin mining operations, the ISA mandated that it complete a biological study of the region. “Stereotypically, us deep sea biologists think that there is not a lot living in the abyss, but we found that actually there is quite a lot living there,” Amon, assistant director of the ABYSSLINE project, tells VOA. “More than half the animals we collected were completely new to science. It just shows how much more work needs to be done in that area because we know so little.” Her group found a new species of anemone and two new species of sponges, but that's not what has them excited. A sea cucumber seen on a bed of polymetallic nodules in the eastern Clarion-Clipperton Zone. Several corals, a sponge and a brittle star can also be seen in the image. Three of the specimens Amon collected were not just newly-identified species, the researchers had to create new, higher-level genus classifications for them. Two of these new genera are in the coral family and the third is a completely new genus and species. Amon’s work also focused on the metallic "potatoes." She found more than half of the animals collected were attached to the nodules. The CCZ terrain is soft, flat seafloor and nodules provide the only hard surface where these creatures can affix themselves. “If mining happens across the entire area, this ecosystem will just be decimated,” Amon cautions. The box core is an excellent piece of sampling equipment because it takes a large chunk of mud out of the seafloor and brings it to the surface, mostly undisturbed. “There is a scientific push to slow things a bit so that the science can be done … so this [mining] can be done as sustainably as possible,” says Amon. VOA reached out to UK Seabed Resources for comment but company officials did not respond in time for this article. The ABYSSLINE project has a five-year mission and Amon expects that more new species and genera will be discovered on future cruises. “I’m looking at year two [data] and already ... I’m seeing ... new stuff,” she says excitedly. It appears there are still plenty of strange new worlds to explore here on Earth.